The black and white zebra print venetian mask has the classic form of a venetian beak style mask and adds a black and white zebra print. This mask pairs up perfectly with our second skin and disappearing man costumes. 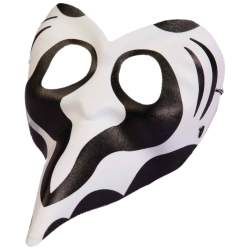 The black and white zebra print venetian mask is colored as pictured, however the shape of the print may vary. Mask is one size fits most using an attached elastic strap.